TORONTO, ON., (February 13, 2014) – Want to see the car with the breakthrough design concept that led to the all-new 2014 Lexus RC coupe, which will soon be available at Canadian dealerships? Come to the Toronto Auto Show, visit the Lexus booth and expect to be amazed by the innovation and design. The breathtaking RC is built around the emotive, avant-garde aesthetics and high-tech focus of the LF-CC and LF-LC, which is on display at the Toronto show. It is part of a ride-and-handling revolution at Lexus that started with the GS, continued with the IS, and now takes another important step forward with the RC. For the RC’s interior, a purpose-built Lexus-first lighting package provides a great sense of occasion, with illumination that reflects upwards, rather than downwards, to envelop the cabin. The driver’s cockpit is divided into operational and display zones. The upper zone houses the instrument panel and a seven-inch navigation screen while a layered centre console integrates a new Lexus first Remote Touch Interface. Importantly for a coupe, the seats utilize an integrated construction method, much like the moulding of racing seats, to ensure optimum occupant comfort and support. For exceptional driving performance, extra thick underbody rocker panels greatly increase the two-door’s rigidity, while new manufacturing techniques, including the use of body adhesives, have strengthened the chassis. Aerodynamic aids, especially on the underbody, contribute to the handling package, as do a double wishbone front suspension and multi-link suspension at the rear. 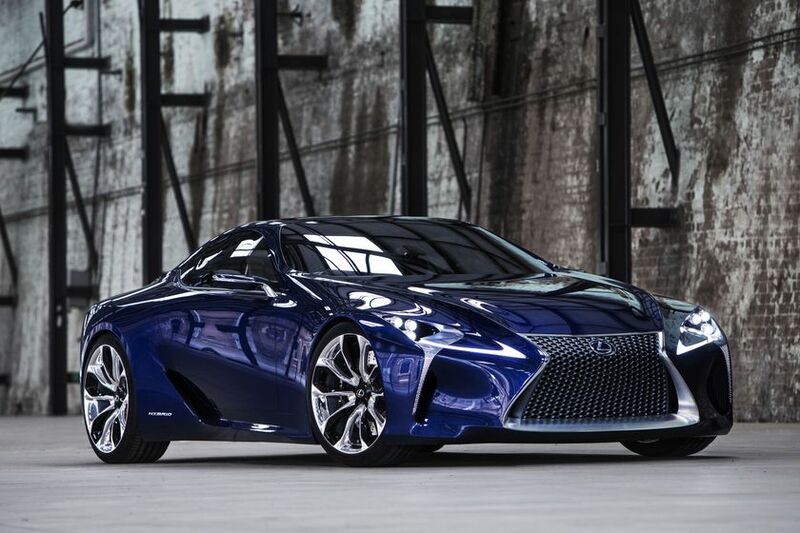 Specific power output per litre of the RC is second only to the super-sports LFA in the Lexus range. The RC F – the high-performance version of the RC coupe – takes the power to an even higher level, with the most powerful Lexus V8 to date, with engine power well above 450 hp and torque above 520Nm. To get that amount of power efficiently to the ground, the RC F makes world-first use of a Torque Vectoring Differential (TVD) in a front-engine rear drive car to guarantee extraordinary levels of handling and performance. The power transfers through a newly calibrated eight-speed transmission. The LF-LC is the brainchild of the company’s Calty design studio in Newport Beach, California. Also on display is an eye-catching, fan-created “deviantART” version of the Lexus IS 350. After partnering with deviantART, the world’s largest online social network for artists, Lexus attracted more than 600 entries in a contest to boost the already-aggressive exterior styling of the IS 350 with even edgier designs. Visitors can check out Robert Evans’ winning submission, with its one-of-a-kind aero styling, carbon interior package, special three-piece wheels, and custom paint job. The Lexus display area is located on the 800 Level of the South Building at the Metro Toronto Convention Centre (MTCC). The show runs February 14-23. Lexus in Canada is the exclusive Canadian distributor of Lexus luxury cars and sport utility vehicles through a sales and service network of 36 dealers across Canada. With 15 Lexus models on the road today, five of them being hybrids, Lexus has the largest luxury hybrid lineup; allowing guests a choice in a large range of luxury vehicle segments. In the 2011 J.D. Power and Associates Initial Quality Study (IQS), Lexus won the most segment awards, four in total, of any nameplate.